We follow a unique TLM (Teaching and Learning Methodology) which benefits the students to understand the concepts easily for long term retention. Acquire: This is the first stage where the faculty introduces the topic. The objective is to introduce and explain the concepts related to the particular session. . 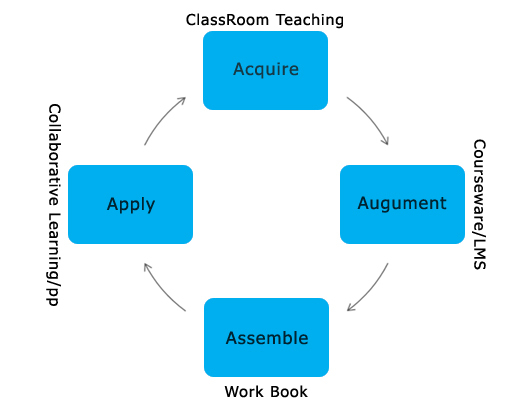 Augment: In this stage, students go through the Courseware and LMS. The objective is to reinforce the concepts through the experience of LMS. .
Assemble: In the third stage, students use the courseware, workbook to revise the contents. The objective is to synthesize learning, practice exercises and plan for solutions. Apply: The final component in the 4A Methodology focuses on the hands-on application of the concepts learnt. The objective is to gain skills by practicing and implementing the solution planned. e-learning, technology enabled learning methods.